Footballs at the NovaCare Complex. The New Jersey State Interscholastic Athletic Association passed a proposal Wednesday that would limit high school football teams to 15 weekly minutes of full-contact practice during the regular season. Teams would also be limited to six hours of total full-contact action during the preseason, including any scrimmage games scheduled between teams, according to the Associated Press. Currently, teams are limited to 90 minutes of full contact weekly during in-season practices, and there is no limit on preseason full-contact action. The new limits would be in line with recommendations from Practice Like Pros, a national foundation featuring medical professionals and former NFL stars which advocates for smarter and safer practices in adolescent football. The regulations are designed to prevent against injuries, specifically head injuries. 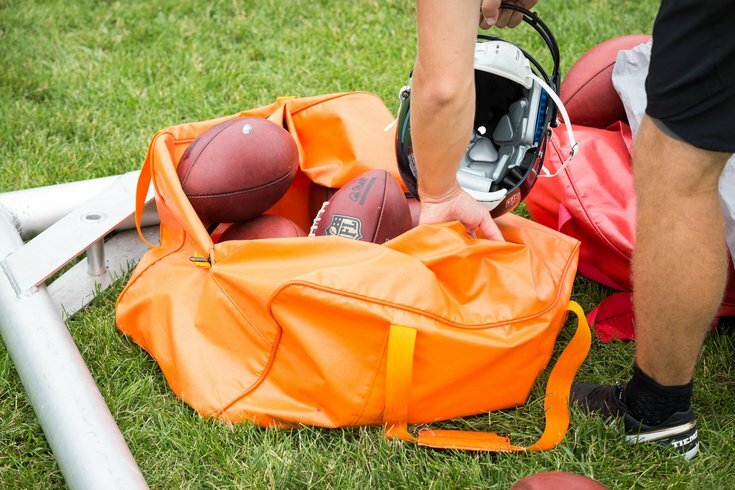 According to Practice Like Pros, 58 percent of high school football concussions happen during practices. So when do we get to teach the proper technique? Less time is not the answer to better tackling. Teaching is the key. Time for schools to separate from the NJSIAA and start a new Association. This rule is going to get kids hurt. You need more than 15 minutes a week to teach the fundamentals of tackling on a human. The new regulations still need to be voted on by the NJSIAA Executive committee in April, but the vote Wednesday was unanimous, according to the Associated Press. Executive director or the NJSIAA, Larry White, told the AP on Wednesday that the organization strives to be a leader in terms of student-athlete health and safety.